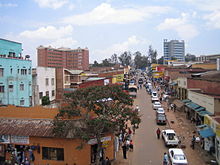 Cathair san Afraic is ea Kigali, príomhchathair agus an chathair is mó i Ruanda. Tá an chathair lonnaithe i lár na tíre. Bhunaigh na Gearmánaigh í sa bhliain 1907. Tá timpeall is 851,024 duine ina gcónaí ann inniu. Tá rialtas na tíre suite i gKigali. Tugadh an leathanach seo cothrom le dáta an 27 Meitheamh 2016 ag 17:25.